A great addition to your harness or child seat straps. their arms through the harness straps. 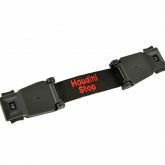 The Houdini Stop Chest Strap is a device which prevents your child from taking their arms out of their harnessing. It consists of two clips joined by a length of webbing material. 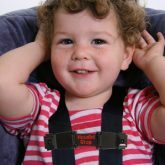 The clips simply connect over the existing harness straps and hold them firmly in position, preventing your child from wriggling out.